wetlands, said an ONGC press release. The photo exhibition was inaugurated by AJ Morbale, Executive Director, Neelam & Heera Asset, ONGC in the presence of PK Dilip, Executive Director, Mumbai High, ONGC and S Gopinath, Executive Director – Head Regional Office, Mumbai, senior executives and other officials from ONGC. ONGC had earlier organized this photo-exhibition at Delhi on January 6. Dharmendra Pradhan, Minister for Petroleum and Natural Gas, Skill Development and Entrepreneurship, inaugurated the event. The Union Minister envisioned Chilika to be developed into an eco-tourism destination. 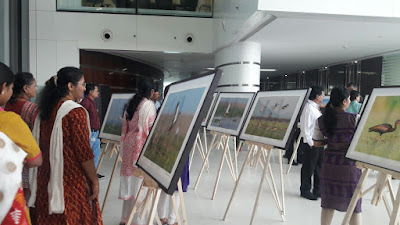 Eminent environment conservationists, Ministry officials, ONGC top management at Mumbai and various NGOs working in the field of environment protection were present at the photo-exhibition. Maharatna oil explorer ONGC is the largest producer of crude oil and natural gas in India, contributing around 70 per cent of domestic production. The crude oil is the raw material used by downstream companies like IOC, BPCL, HPCL to produce petroleum products like petrol, diesel, kerosene, naphtha, cooking gas-LPG. ONGC has a unique distinction of being a company with in-house service capabilities in all areas of exploration and production of oil and gas and related oil-field services. Its wholly-owned subsidiary ONGC Videsh Limited (OVL) is the biggest Indian multinational in the energy space, participating in 36 oil and gas properties in 17 countries. ONGC subsidiary Mangalore Refinery and Petrochemicals Limited (MRPL) is a Schedule ‘A’ Miniratna, with a single-location refining capacity of 15 million tons per annum.